Bayern in 1916 during high speed trials, which were conducted off Neukrug in the Baltic. This is an interesting photograph as it shows how the normal wave/hull interaction can expose the armored belt under the waterline even in mild seas. Photograph copyrighted by HDW. The most powerful German naval gun of World War I. 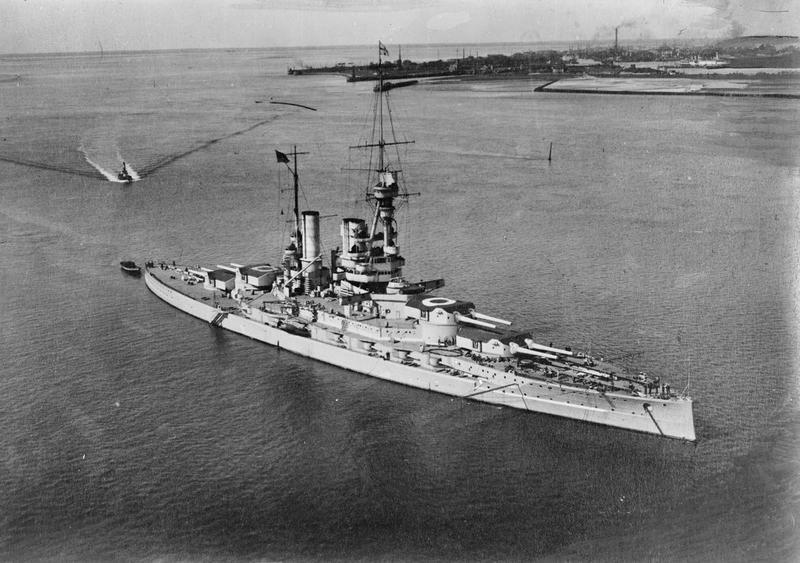 Used on the Baden class battleships, which were completed too late to participate in the Battle of Jutland (Skagerrak) and saw little action during the rest of the war. 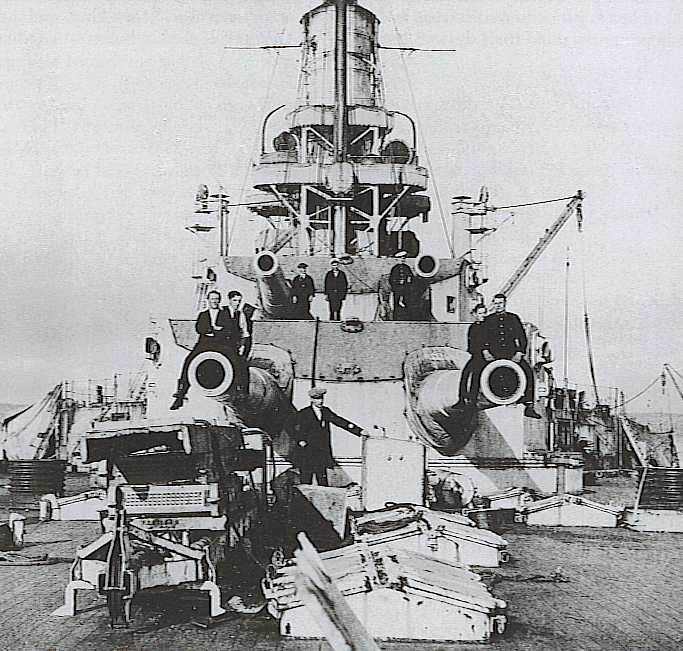 Those guns planned for the uncompleted battleships Sachsen and Württemberg were instead used on the Western Front where they were known as "Max" or "Lange Max" (Long Max). Coast Defense Battery Deutschland was equipped with four of these guns and Battery Pommern had one more. The Pommern battery, located at Leugenboom in Belgium, is perhaps best known for firing about 500 rounds between June 1917 and October 1918 at ranges of up to about 48,000 yards (44,000 m) including many at Allied positions in and around Dunkirk (Dunkerque). One gun was greatly altered and became the long range "Paris Gun." The naval mountings for these guns used electric pumps to drive hydraulic elevation gear while the training was all electric. These guns also had hydraulically worked shell hoists, rammers and breeches. Constructed from shrunk on tubes and hoops and used a Krupp horizontal sliding wedge breech block. Gun at Battery Pommern battery was Krupp No. 15 L. The four guns at Battery Deutschland were Krupp No. 9 L, No. 35 L, No. 36 L and No. 41 L.
^For an interesting comparison of British and German guns as seen by British ordnance personnel, see the extract from "Progress in Gunnery Material, 1921" ADM 186/251 on the British 15"/42 (38.1 cm) Mark I datapage. 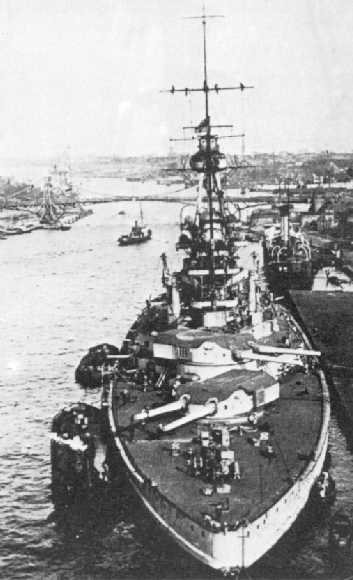 Post-war loading tests by the British on Baden found that it took only 23 seconds from the time the guns fired until they were ready to fire again, compared to 36 seconds for the 15 inch (38.1 cm) guns on Queen Elizabeth. "The difference included a much faster cycle for firing, recoil, runout and return to loading position (2.5 seconds vs. 6 seconds) . . . Also, the Queen Elizabeth required a much longer time (5 seconds vs. 1.5 seconds to open the breech and a similarly long time to close it because it used a long-arm mechanism." In addition, unlike the Royal Navy, the gun sights on the German directors and turrets were not directly connected to the gun barrels, which meant that they could remain on the target while the guns reloaded. 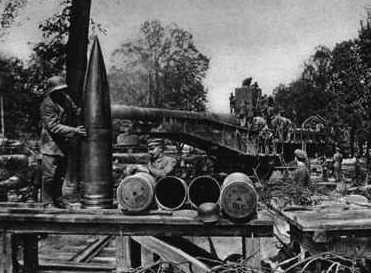 ^In "The German Defenses on the Coast of Belgium" the author notes another HE shell of 754 lbs. (342 kg) with a range of 52,000 yards (48,000 m) but this seems to be the Coastal HE L/4,1. ^There were other Coastal Artillery projectiles under development during the war which did not enter service, with one of these still surviving at the German Historical Museum in Berlin (Deutsches Historisches Museum). ^AP and HE were about 5crh. ^Coastal HE L/5,4 was 10crh. The HE L/5,4 Projectile used a long, streamlined nose for maximum range. Burster for this projectile was split into two charges: Upper charge was 64.3 lbs. (29.15 kg) TNT and lower charge was 73.2 lbs. (33.21 kg) TNT. One of the HE L/5,4 projectiles is on display at the museum at Verdun, France. ^From ADM 186/251, it would appear that the main charge was about 360 lbs. (163 kg), which would imply that the fore charge was about 250 lbs. (114 kg). "The German Defenses on the Coast of Belgium" says that there were three charges used for coastal guns, the "Hutzenkartasch" (Hauptkartusche or Main) cartridge case with 191.8 lbs. (87 kg) of propellant and two different "Vorkartasche" (Vorkartusche or Fore) charges with 211.6 lbs. (96 kg) and 260.1 lbs. (118 kg) of propellant. This work states that there were two propellant loads used, 191.8 + 260.1 lbs. = 451.9 lbs. (87 + 118 kg = 205 kg) or 191.8 + 211.6 + 260.1 lbs. = 663.5 lbs. (87 + 96 + 118 kg = 301 kg). ^The original muzzle velocity was 2,920 fps (890 mps) but dispersion was unacceptable at this velocity. ^Outfit for the Baden class was 60 APC and 30 HE per gun. The above information is from "German Capital Ships of World War Two" and is derived from trials conducted in 1938 when these guns were compared against the 38 cm guns intended for the Bismarck class battleships. ^There is evidence to suggest that these guns achieved penetrations of 13.23 in (336 mm) at 21,872 yards (20,000 m) against World War I-era armor. The above information is from "M.D.V. 352 Heft 09." ^The penetration in this table is for intact penetration in a condition fit to burst after striking at a 30 degree obliquity (60 degrees per the German definition) against improved quality KC armor of the World War I era and not against the original, 1890´s KC/a. This data is only for Bayern, other ships may be different. Turrets were powered as much as possible with electric motors directly, with electrically powered hydraulics being used only for the elevating gear and for the hoists. Each turret had a machinery room directly below the turret, followed by a handling room. At the bottom of the stalk was a cartridge handling room which held 36 fore charges. Main charges and additional fore charges were stored in the magazines. Cartridges were loaded onto a central hoist below the handling room while projectiles were loaded on the next deck below. Projectile hoists ran directly from the handling room to the gunhouse. Once in the gunhouse, the projectiles and cartridges were power rammed towards the rear of the turret onto powered loading cars which ran on rails across the turret. These cars could feed either gun, but normally the guns were loaded together. 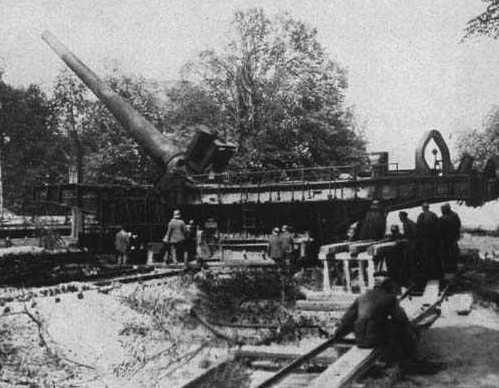 As the breech mechanism did not extend past the end of the gun, the breeches could be opened before the cars were in place, thus speeding the loading cycle. Shell and cartridges were loaded by a chain and telescoping rammer. The projectile was rammed first and then both propellant charges were rammed as a unit. The total length of both charges was 63 in (160 cm). ADM 186/251 notes that the shell grabs and the foot grip plating used in the shell rooms were both very efficient and should be copied in future British designs. 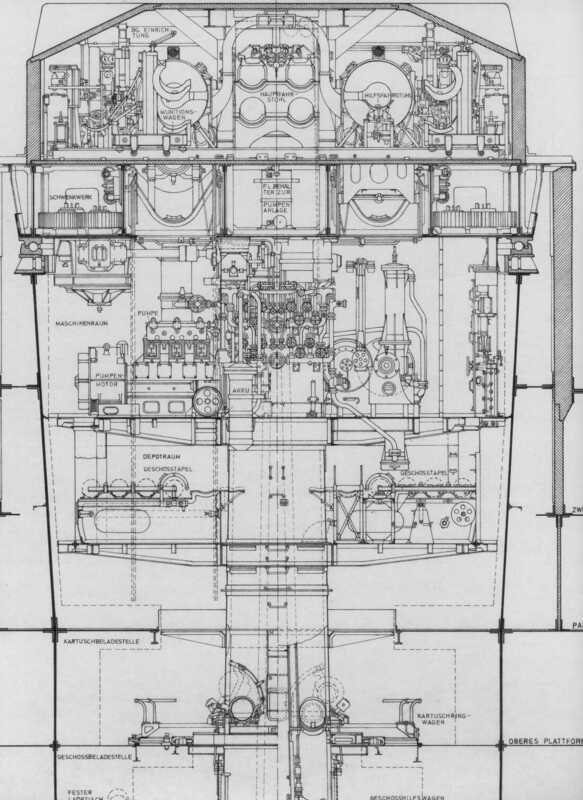 However, it also notes that the Auxiliary Loading Chamber was "both a poor and an elaborate arrangement." The Auxiliary Loading Chamber allowed an "alternate supply of six projectiles per gun to be sent to the gun-house by means of an electrically driven hoist. There is no ready means of replenishing the secondary loading compartment from the shell room." Gun axes were 145.6 in (370 cm). ^Typical of German designs, these turrets ran on ball races containing 144 steel ball bearings of about 6.5 inches (16.5 cm) in diameter. Roller bearing ring diameter was 28.7 feet (8.75 m). ^British post-war analysis of the mountings on Baden criticized them for their lack of flash protection, but this seems overstated. The German use of enclosing all charges in brass greatly reduced the risk of flash igniting the charges thus they did not need the elaborate anti-flash fittings found in British post-Jutland designs. The analysis noted that the German turrets were less foolproof than British designs as there were places where mistakes could jam them. The British report further stated that there was "a remarkable absence of precautions against sabotage" which seems more of a curious indictment against British sailors than a criticism of the German design. ^Elevation in Baden was not increased during the war. Any ship completed after Bayern would probably also have had an elevation range of -5 / +20 degrees. Baden at Wilhelmshaven, May 1918. Note the ram bow, uncluttered amidships, flying bridges and aircraft recognition symbols atop the turrets, all typical of German battleships of this period. IWM Photograph Q 51020. Rear Turrets of Baden. Note the thin barrel walls at the muzzle. Picture probably taken at Scapa Flow after internment. 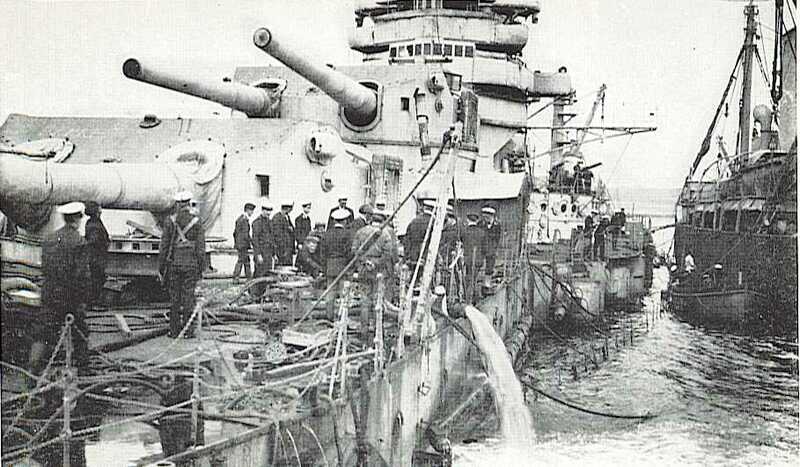 Forward turrets on Baden during salvage operations in 1919. Picture copyrighted by P.A. Vicary. SMS Bayern at Wilhelmshaven in 1917. Bibliothek für Zeitgeschichte (Stuttgart) Photograph. 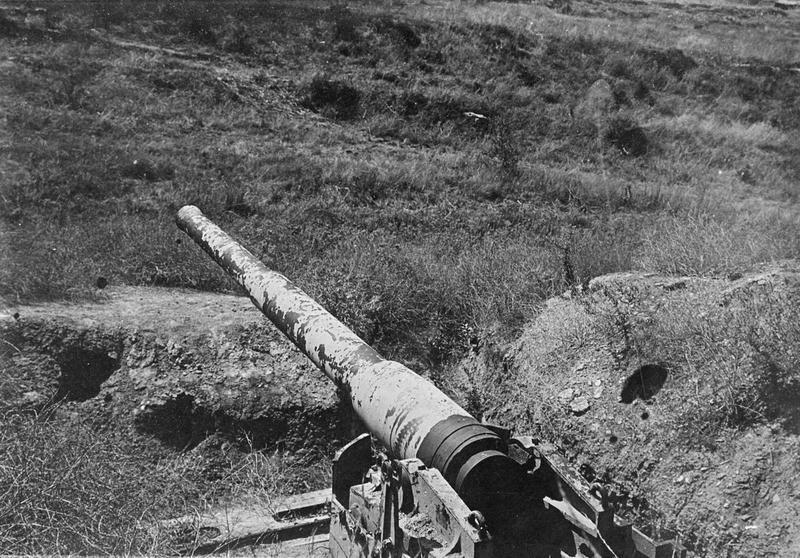 38 cm/45 gun used as Coastal Artillery. Reichs Marine Sammlung Collection. IWM Photograph Q 50988. 38 cm/45 as "Long Max" Land Artillery. Photograph courtesy of Images of the Great War. Special Coastal Projectile as used with "Long Max". Photograph courtesy of Images of the Great War. Comparison of 30.5 cm/50 and 38 cm/45 guns. Picture courtesy of Peter Lienau. Sketch of 38 cm/45 Turret. Picture courtesy of Peter Lienau. "The Baden Trials" article by William Schleihauf in "Warship 2007"
"M.D.V. 352 Heft 09" Vize Adm. Trotha, Der Organismus der Kaiserlichen Marine und der erste Weltkrieg, Berlin 1930, and has been tabulated by Vize Admiral Rogge there at p.75.